I have perfected roasted chicken and vegetables. 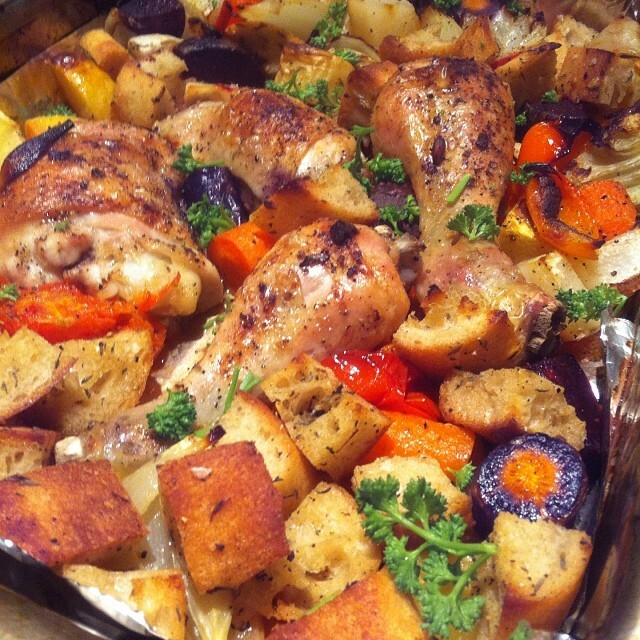 A favourite weeknight fall and winter meal of mine is roasting a couple chicken legs, separated at the joint for even cooking, with chunky cut vegetables. I started making this combination for myself sometime during university, after I learned to make Oven BBQ Chicken from the Joy of Cooking. My standard method in the past used barbecue sauce, applied as described in the Joy recipe, and I would surround the chicken parts with zucchini, button mushrooms, and bell pepper. Sometimes I’d add some potatoes.